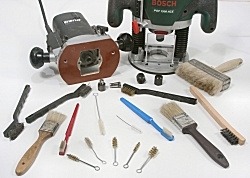 Various kinds of brush can be used for all sorts of odd jobs in the workshop, quite apart from applying paint, varnish etc. Here are a few ideas. Narrow cylindrical brushes are ideal for cleaning collets and motor spindles. They can be obtained from household shops, your dentist, or you can get a special set of brass ones from Trend. Here you can see a 1/4in collet being cleaned with a dental brush. These are sold for cleaning dental braces. 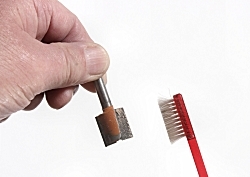 A toothbrush or similar stiff brush is an excellent tool for removing loose dust from cutters, before cleaning with a solvent. 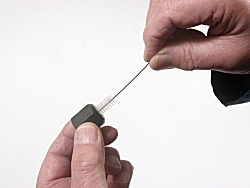 A soft wire brush can also be used for more stubborn dust. Sets of nylon, brass and steel bristled brushes can be bought from household stores. 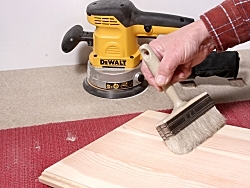 Small stiff-bristled brushes are very useful for cleaning the resinous dust from the nooks and crannies of your tools, while paint brushes will reach into deeper areas to clean out accumulations of dry sawdust. After sanding a panel, the dust not collected in the dustbag can be brushed off with a soft wood preservative brush or a broad paintbrush. Mine came from the local DIY superstore. 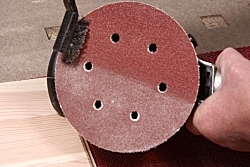 Dust deposits on the discs and sheets of random orbit and orbital sanders can be brushed off periodically with a stiff-bristled brush. 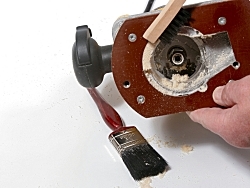 If the dust is very resinous, a soft wire brush is more effective.